Light calcareous stone materials used in connection with cultural heritage objects, such as pedestals, or used as wall facings in connection with bronze statues or joints often show green staining due to the corrosion products from the bronze elements. The green stains alter the appearance of the monument and thus disrupt the original intention. Due to this, several cleaning methods, often involving ammonia, have been developed for removal of copper stains from stone surfaces. This paper describes a new, highly efficient method for cleaning copper stains from calcareous stone by introducing the chelating agent ethylenediamine in a poultice consisting of Laponite® RD, Arbocel® BC1000 and CMC. Cleaning experiments were performed on marble and on a calcareous sandstone plinth contaminated with natural copper corrosion products due to outdoor exposure of an untreated bronze statue. The cleaning results were evaluated by visual observations. The chemical cleaning of copper stained calcareous stone surfaces has been investigated and a new method for removal of copper stains has been developed. A solution of 0.1 M ethylenediamine in a poultice consisting of Laponite® RD/Arbocel® BC1000/CMC has shown to be an effective, economical, and fast do-it-yourself method. Light calcareous stone materials used in connection with cultural heritage objects, such as pedestals, or used as wall facings in connection with bronze or copper statues or joints often show green staining due to the corrosion products from the copper-containing materials . The green stains alter the appearance of the monument, and therefore stone conservators and conservation scientists are constantly working with the cleaning of stone monuments as well as the development of new efficient cleaning methods . Discolouration due to metal corrosion is observed when composite artefacts of uncoated metal and porous stone are located in an outdoor environment [2–4]. The corrosion mechanism observed in connection with uncoated bronze statues and monuments is generally well understood [1, 2, 5]. The first step is oxidation of copper metal by atmospheric dioxygen (O2), which creates a layer of cuprite (Cu2O), which in turn reacts with rain and atmospheric impurities to subsequently build up a layer of greenish patina [6–9]. The patina consists mainly of salts of basic copper(II) sulphates, such as brochantite (Cu4(SO4)(OH)6), and to a lesser extent of basic copper(II) chlorides like atacamite (Cu2Cl(OH)3) [5–8] and in rarer cases also malachite (Cu2(CO3)(OH)2) . Dissolution of the patina by rainwater transports the soluble ions to the nearby porous stone material, where reprecipitation occurs and greenish stains are subsequently formed in the pores and on the surface of the stone material [1, 2]. The cleaning of stained stone material is mainly performed by chemical cleaning methods using ligands that coordinates to the metal ion causing the stains, and thereby dissolving the stains [2, 3]. Several criteria must be met when selecting ligands for chemical cleaning. The ligands have to show high affinity and stability towards the metal ion in question and low affinity towards the stone material itself, mainly Ca2+. Furthermore the ligands have to be non-toxic for the conservators, simple to handle and dispose, kinetically fast-reacting, easily obtainable and economical affordable [2, 3]. A standard ligand used for the removal of copper stains from stone surfaces is ammonia, NH3, due to the formation of the well-known blue tetraamminecopper(II) complex . NH3 can be applied either from an aqueous solution of ammonia or from a solution of ammonium carbonate ((NH4)2CO3) , which forms an ammonium/ammonia buffer in solution. The hexadentate ligand edta (ethylenediaminetetraacetic acid) has also been used, although its affinity towards Ca2+ is troublesome [2, 3]. Recently the use of the amino acids alanine (ala), cysteine (cys) and tyrosine (tyr) has been investigated, and the mixture of alanine + ammonia in a poultice of sepiolite and Arbocel® BC1000 has shown effective cleaning results . In this paper the bidentate ligand ethylenediamine (en, ethane-1,2-diamine) will be introduced as an effective cleaning agent for removal of copper stains on calcareous stone. The ligand is applied in the newly developed poultice consisting of Laponite® RD, Arbocel® BC1000, and CMC (carboxymethyl cellulose, sodium salt) which has recently been introduced for the cleaning of rust stained marble . gives [Cu2+] = 0.5 μM, showing the very low solubility of brochantite. The basic copper(II) chloride, atacamite, when written as containing four copper(II) ions, Cu4Cl2(OH)6, has a solubility product, Ksp = 10−69.8 M12 , whereas the solubility product for malachite written as Cu4(CO3)2(OH)4 is Ksp = 10−67.6 M10 . As seen the from the Ksp values, all three patina products shows low solubility, however the different units of the constants should be taken into account when comparing the values. Assuming excess of ethylenediamine e.g. 0.1 M, which gives a concentration of [OH−] ≈ 0.01, it is seen that brochantite is easily soluble in a solution of ethylenediamine, and buffering to a lower pH value e.g. pH = 10 will further increase the solubility. The overall formation constants of Cu2+ and Ca2+ complexes of NH3 and en , cyclam , ala , tyr , cys , and edta  are shown in Table 1. As seen from the available constants for Ca2+, only edta shows complex formation in an order able to cause problematic dissolution of calcareous stone materials, whereas the am(m)ines and amino acids show practically no affinity towards Ca2+. In respect to solubilization of copper stains, using brochantite as an example, the overall stability constant for an efficient ligand should be in the range of approximately 1015–1017 at the minimum (assuming excess of ligand at 0.1 M and pH = 10). This means that all the aforementioned amino acids are useful cleaning agents, though ammonia shows a relatively low cleaning efficiency. The cyclic tetraamine cyclam shows the highest stability constant towards Cu2+, however, the cost of cyclam makes cleaning of a larger area unrealistic, even though its use as an effective ligand for qualitative analysis, i.e. spot test for Cu2+, has been shown . β n = [MLn]/[M][L]n; β n = K1 × K2 × …..Kn; [x] = ref. From a thermodynamic point of view, ethylenediamine is an effective cleaning agent due to its strong affinity towards Cu2+. The bis-complex formed with ethylenediamine has a distorted octahedral structure, with the four ligating N-atoms forming the equatorial plane and two loosely bound water molecules in the axial positions . This structure, which practically can be regarded as square-planar is also observed for the tetraammine copper(II) complex , the cyclam complex , and the bis(amino acidates) complexes . A depiction of the copper(II) complexes, [Cu(en)]2+, [Cu(cyclam)]2+, and [Cu(ala)2], illustrating the four ligating atoms forming the plane, is shown in Fig. 1. Ethylenediamine is a dibasic amine (pKb1 = 3.8 and pKb2 = 6,7) , and pH in a 0.1 M solution can be calculated to pH = 11.6. During the cleaning reaction, the pH value is likely to increase due to release of hydroxide anions from the basic copper(II) salts. The application of ethylenediamine on calcareous stone can therefore be performed without addition of a basic buffer. The chelate complex [Cu(en)2]2+ has a characteristic dark violet colour, making the cleaning easy to follow when the solubilized copper stains are extracted into the poultice. On the other hand, the poultice mixture used needs to possess a high capillary suction and retention of the copper complex in order to avoid a purple discolouration of the stone material. In this work, the poultice consisting of Laponite® RD/Arbocel® BC1000/CMC was used. This poultice has shown to be effective for cleaning rust stained marble  and, by changing the chemical cleaning agents from dithionite and cysteine to ethylenediamine, effective cleaning of copper stains was achieved. The cleaning experiments were performed both in the laboratory as well as in a lapidarium in order to operate at the lower temperatures that characterize the Nordic climate. Additionally, cleaning experiments with different concentrations of ethylenediamine and CMC were evaluated. Copper stained marble plates of the type Carrara Bianco Lorano were retrieved from KUNSTEN Museum of Modern Art Aalborg in connection with its restoration. The building was designed by the Finnish architects Alvar Aalto and Elissa Aalto along with the Danish architect Jean-Jacques Barüel. Carrara marble was used as wall facing of the building, which was completed in 1972. After 42 years of weathering, the marble plates were contaminated with green copper stains. For experiments, the marble plates were cut into pieces of c. 5 × 5 cm. A calcareous sandstone plinth (90 × 70 cm) contaminated with green copper stains from corrosion of its bronze sculpture was obtained from the lapidarium belonging to FBN Stenhuggeri A/S in Denmark. The plinth originated from a statue owned by Ny Carlsberg Glyptotek and was collected in connection with replacement of the plinth. A high gloss, polished marble of the type Carrara Bianco, Lorano was used for etching experiments. All cleaning experiments were performed in vertical position. The cleaning experiments on the marble pieces were performed in the laboratory at ambient temperature and relative humidity, RH. The poultice material consisted of Laponite® RD, Arbocel® BC1000, and CMC mixed in the ratio Laponite® RD/Arbocel® BC1000/CMC = 10:10:1, giving a CMC content at 5 % (w/w) and the concentration of the ethylenediamine solution was 0.1 M. For cleaning of an area of ca. 100 cm2, the following recipe was used: 2.6 g of ethylenediamine (43 mmol) was dissolved in 430 mL of tap water by stirring. The solution was then stirred into a 2 L beaker containing a blend of 50 g Laponite® RD, 50 g Arbocel® BC1000 and 5 g CMC. 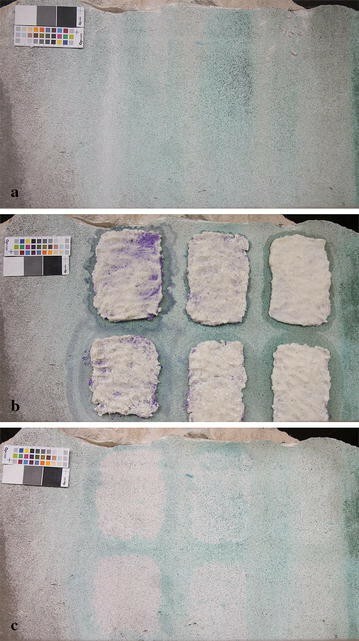 The wet poultice was applied on the pre-wetted calcareous stone surface in a 1–1.5 cm thick layer, covered with polyethylene food wrap, and left for 24 h. The plastic film was then removed and the poultice was left overnight to dry. The poultice was then removed and the sample was thereafter rinsed with water and dried in the air. The experiments for cleaning the calcareous sandstone were performed in the lapidarium with variations in temperature (6–13 °C) and RH (100–75 %). Additionally, the concentration of ethylenediamine was varied i.e. 0.1, 0.05, and 0.01 M, and the CMC content was tested at mixing ratio at 5 and 1 %. Due to the lower temperatures, the drying time of the poultices was extended to 48 h.
All cleaning experiments were performed in vertical position and no sliding of the poultice was observed. Figure 2 illustrates the effect of the cleaning experiments on the marble from KUNSTEN Museum of Modern Art Aalborg. Figure 2a shows the green copper stained marble piece before cleaning and Fig. 2b shows the same piece after cleaning of the right half of the stone area. As seen in Fig. 2b, the cleaning poultice resulted in a uniformly clean area with no visible purple rim or hue in the cleaned area. However, some greenish spots can be vaguely seen due to copper stains lying deep beneath the stone surface. Due to the Nordic climate, cleaning stone surfaces in Scandinavia is generally limited to the warm summer months, when temperatures exceed 20 °C. To investigate whether the ethylenediamine-laponite poultice could be effective in spring and autumn, the experiments on the sandstone plinth were performed in the lapidarium having T = 6–13 °C and RH = 100–75 %. The sand stone before cleaning can be seen in Fig. 3a. Figure 3b shows the sand stone with poultice having different compositions, i.e. top: CMC = 5 % and bottom: CMC = 1 %, and from left to right en = 0.1, 0.05, and 0.01 M, respectively. Figure 3c illustrates the results after cleaning. As seen in Fig. 3b, the reaction between ethylenediamine and copper(II) is visible as an intense violet colouring of the poultice, varying from intense to barely detectable as the concentration of ethylenediamine decreases from 0.1 to 0.01 M. The effect of the treatment depends on the concentration of ethylenediamine, and, as seen in Fig. 3c, the concentration at 0.1 M produced the best results. Due to the lower temperatures, the poultices were still wet after 24 h and were therefore left to dry for an additional 24 h. Upon removal, the poultices containing 5 % CMC were still wet inside and had good adherence to the surface, resulting in partly crumbling and residues sticking to the surface. The poultices containing 1 % CMC were easy to remove, although they still remained slightly wet. The variation of the CMC content mainly affects the drying time. The poultices having a mixing ratio of 5 % CMC tends to form a film on the surface that decreases the water evaporation resulting in a longer drying time. However, the poultice containing 1 % CMC exhibited poor internal cohesion between the poultice components, which influenced its workability. This resulted in longer application time, as the poultice has to be applied in smaller portions and its adherence to the stone surface was more difficult and laborious. Cleaning of copper stained calcareous stone was investigated by the use of ethylenediamine as a cleaning agent in the newly developed poultice containing Laponite® RD, Arbocel® BC1000 and CMC. The cleaning system was tested on samples of natural copper stained marble in the laboratory and on a copper stained calcareous sandstone plinth in a lapidarium. The lapidarium had low temperatures and high RH (T = 6–13 °C; RH = 100–75 %) and was chosen in order to examine the appropriateness of the cleaning system in the Nordic climate during spring and autumn. A mixing ratio of Laponite® RD/Arbocel® BC100 = 1:1 + 5 % CMC in 0.1 M ethylenediamine solution gave a fast and efficient cleaning of copper stained calcareous stone material in the laboratory. The laboratory conditions represent ambient temperature in the summer months in the Nordic countries, the normal period for cleaning of outdoor stone monuments. The use of this poultice-mixing ratio at lower temperatures and higher RH resulted in longer drying time of the poultice, hence a longer cleaning time. Lowering of the CMC content in order to increase the drying time is possible; however, the workability of the poultice is less satisfactory and results in longer application time and poorer adherence to the stone surface. Even though it is possible to remove copper stains on outdoor monuments at temperature lower than 20–25 °C, working in the warm summer months gives the best conditions for application and drying of the poultice and hence the fastest cleaning results. For cleaning of an area of ca. 100 cm2, the following recipe can be used: 2.6 g of ethylenediamine (43 mmol) is dissolved in 430 mL of tap water by stirring. The solution is then stirred into a 2 L beaker containing a blend of 50 g Laponite® RD, 50 g Arbocel® BC1000 and 5 g CMC. Before applying the poultice, the area is cleaned by wet-brushing in order to remove soluble deposits and salts. This wetting also gives a better adherence of the poultice. The wet poultice is applied on the calcareous stone surface in a 1–1.5 cm thick layer, covered with polyethylene food wrap, and left for 24 h. The plastic film is removed and the poultice is left overnight to dry. The poultice is then removed, disposed of in accordance with national regulations and the stone surface is finally rinsed with water. A microscopic examination of the amount of copper salts remaining in the stone material has not been performed as the presence of copper salts is slightly visible in the deeper areas. In the previous study on cleaning of rust discolouration from marble it was shown from cross sections that the cleaning depth was depending on the porosity of the stone material . Similarly, a spectroscopic examination of any dissolution of calcium ions from the stone material has also been omitted. Future investigations of these questions would answer whether this method can be used on precious artwork. The cleaning method is meant to be used on stone material placed in outdoor environment where natural weathering of the surface is occurring. However, the method was tested on high gloss polished marble and no etching was observed by comparing it to the untreated neighbouring areas. This, likely, reflects, the yet undetermined, very low stability constant between Ca2+ and ethylene diamine. In addition to this, ethylene diamine is cost effective as the price is around 30 euros per liter (in 2016) , and cleaning of unattractive copper stains from a surface facing will extend its life time and thereby be an economic benefit. All authors contributed to data interpretation and to finalizing the manuscript. All authors read and approved the final manuscript. The authors would like to thank The Scandinavia-Japan Sasakawa Foundation, The Okayama University International Exchange Scholarship, and The Danish Chemical Society Travel Foundation for making first authors research stay in Okayama, Japan possible. Finally, we thank Maya Coulson for critically reviewing the text. Ethylenediamine ReagentPlus®, ≥99 % (E26266) [http://www.sigmaaldrich.com].